The premium travel trade show which concluded recently at the Bombay Convention and Exhibition Centre witnessed a flurry of activities, that could boost business for India’s tourism industry. 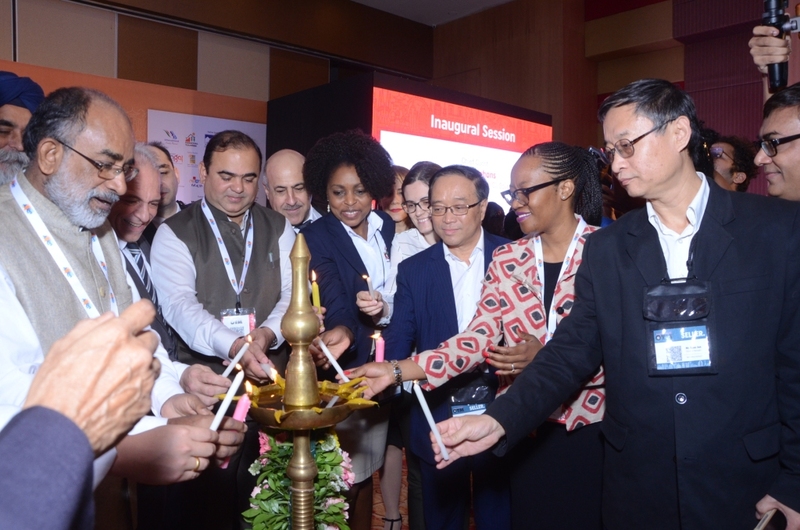 The latest leg of OTM was organised from January 18 to 20 in Mumbai and witnessed participation from 45 countries. The travel trade show boasted of the biggest country pavilions belonging to Turkey, Greece and Thailand, Cox & Kings has signed up with OTM for the next three years, as the Knowledge Partner while Google partnered with OTM to organise CMO workshops on the sidelines of the event. The event was inaugurated in the presence of the Chief Guest K J Alphons, Minister of State for Tourism, Government of India and Guest of Honour, Jaykumar Rawal, Minister of Tourism, Government of Maharashtra. Alphons stated that the government has set a target of doubling the number of foreign tourist arrivals (FTAs) at 20 million as well as earnings from the sector by 2020. Himachal Pradesh, Madhya Pradesh, Andaman and Nicobar, Andhra Pradesh along with few other states had set up pavilions at the show. The Ministry of Development of North Eastern Region (DoNER) executed a mega publicity exercise at OTM for promoting North-Eastern destinations. “OTM is Asia Pacific’s Largest Travel Show. People from across the travel industry participate in this event which helps in promoting the tourism industry. This event has a legacy of 28 years and after Germany and London, OTM Mumbai is one of the largest travel trade shows globally. With the help of this platform, our efforts are to showcase the treasure of tourism that we possess in Mumbai, Maharashtra and the rest of the country,” Jaykumar Rawal stated during the inaugural ceremony of the three-day event. The China Tourism delegation ensured their attendance in a big way at OTM 2018. Tian Xin, Director, China National Tourist Office, New Delhi termed OTM as a very effective platform. “OTM has undoubtedly helped us understand the travel needs of the Indian market as well as the requirements of the travel trade,” he said. India is one of the largest markets for travel and tourism in the world. Indians take around 22 million trips abroad and more than a billion within the country. Mumbai, the financial capital of India, is the largest source market of domestic and outbound travel for Leisure, MICE (Business, Meetings, Incentive, Conventions and Events) and Weddings. It also serves as the ‘Gateway of India’ to the largest number of travellers going abroad from other cities and towns, especially in Western and Southern India. With USD 209 Billion spend in 2017, India’s tourism industry was ranked 7th largest in the world. It contributes about one-tenth to the GDP and employment. OTM which is one of the largest travel trade shows in the Asia Pacific region plans to tap this potential while laying emphasis on B2B transactions to realise the goal. Karan Anand, Head-Relationships, Cox & Kings feels the same while stating the event helps to take a close peek into the B2B market. “This year we are promoting ourselves as MICE as well as a Wedding and Film destination; OTM is a right platform for us to do so,” said Demetrios A Theophylactou, High Commissioner of Cyprus in Mumbai. In an exit survey, 98 pc of the participants confirmed they are likely to return to OTM 2019. Dignitaries at the panel discussion – Cine Locales by Film Tourism Consortium brought to the fore the permits involved and the reasons why film producers find it easier to shoot a film abroad. Jaykumar Rawal, Minister of Tourism, Government of Maharashtra thanked the panellists for bringing up the concerns at OTM 2018 and assured the producers that by OTM 2019, the said issues will get resolved as far as shooting in Maharashtra was concerned. He also asserted that Mumbai is home to Bollywood and all should work at selling Mumbai first and then the rest of India. Vice chairman of Jammu and Kashmir (J&K) Tourism Development Corporation, Rafi Ahmad Mir, who also attended OTM in Mumbai said that Kashmir is open to Bollywood for shooting and film tourism and that the state will provide all the possible support to the industry. J&K Government participated as a partner state in the mart and held an interactive session with members of the film fraternity on ‘Bollywood tourism and the role of state government in incentivising the industry’. Mir along with film fraternity representatives stressed on the need of incentivising and having an ease of shooting in Jammu and Kashmir with a favourable state film policy. “Production houses like Yashraj sought Destination Marketing for Bollywood and FTR – Film Tax Relief Program of exemption which is available to them abroad. Responding to that Mir said that the valley was open to Bollywood for shooting,” reads a statement from the event report. It also stated that the government was keen to provide a single window clearance system and other benefits to filmmakers. According to the statement, the process of streamlining has already been initiated.